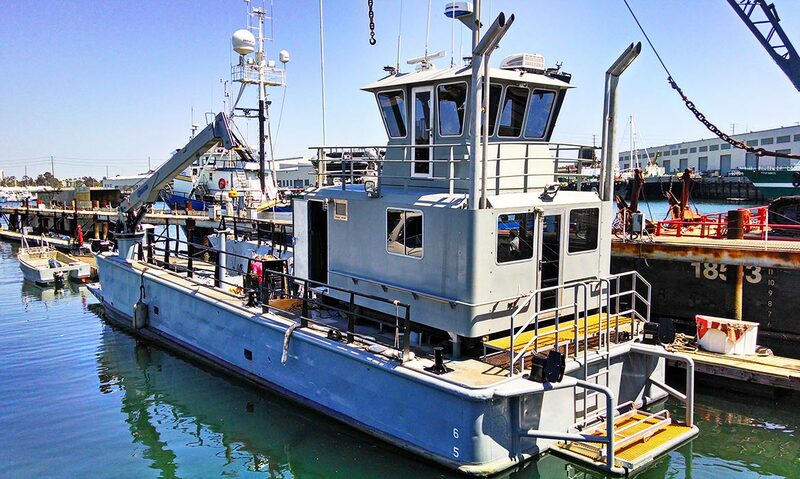 On April 21, Curtin Maritime, a Long Beach-based marine construction and tug and barge operator, delivered a repowered and retrofitted LCM-8, Sea Force, to the Port of Long Beach Harbor Patrol. Curtin Maritime was awarded a $1.5 million contract for the design-build project in 2013. The project included the design and fabrication of a new upper and lower house, Tier III-rated engines and generators plus a hydraulic system with a hydro crane and four point mooring system. The Long Beach Harbor Patrol acquired the vessel from the US Dept. 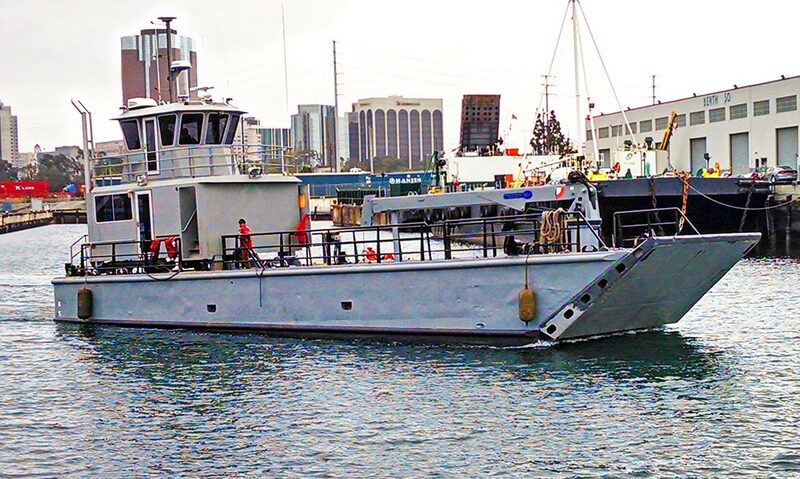 of Defense in 2010, with a goal of converting the boat into a platform that could support both POLB commercial dive units operations, plus serve as an emergency response and salvage vessel within the port. Because there was no existing design that fulfilled all the requirements, a Request for Proposals with a design build spec was issued by the port to the local shipyards. After Curtin Maritime was awarded the contract, it was delivered the boat and the project got underway. Work included the demolition of all the old systems, engine removal and engine room modifications. The old Detroit 12v71 engines were replaced with a set of new Tier III 13.5L John Deere 6135’s mated to the existing 5-14 gear boxes. Also, two new Tier III John Deere MG65 gensets were put in and mated to dual 66.5-gpm Kawasaki KV3L140 hydraulic pumps. 4 Pull Master H18’s with rapid reversing and 150KG Flipper Delta anchors made up the 4-point system and an 8-ton Hydro crane was mounted on the port side. The boat was also dry docked and completely repainted and had all new handrails installed. Custom dive ladders were also placed on both the stern and bow. During an April 21 unveiling at the refurbished vessel at the Port of Long Beach, Harbor Commission President Doug Drummond praised the work performed on the vessel, saying the boat can now play a part in helping keep the harbor safe during times of trouble. The Becker #1 well, located on Summerland Beach in Santa Barbara County, first made history in the 1890’s when it was one of the first offshore wells drilled in the U.S. and is once again making history as one of the first of these vintage offshore wells to be permanently abandoned. The Becker well is notorious to local beach-goers as it has been the source of visible oil seepage for years. 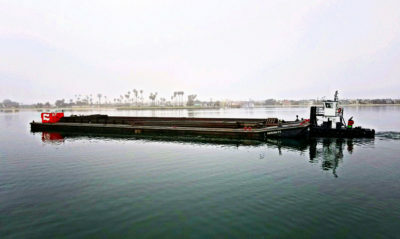 This is the most extensive San Diego bay dredging project since the late 1940's. 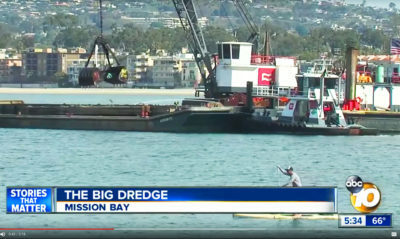 Dredging will redistribute mud and sand from the bottom of Mission Bay. 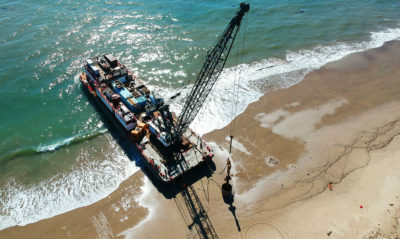 When dredging is complete, a massive eelgrass replacement will begin, one of the largest environmental efforts of this kind in the country.